Located between AT&T Stadium and Globe Life Park is a sculpture trail intended to be a tribute to the citizen's of Arlington. Leave your Mark is an 8' tall rose sculpture with fingerprint cut-outs in the petals symbolic of the mark and legacy left by Arlington residents through their volunteering, voting and support of this great city. Leave Your Mark is available for purchase while on exhibition. Growing up on the Llano Estacado I have always been moved by the boldness between the horizontal separation of the blue sky and the red earth. Equally striking is the tapestry of fields that shape the cultural landscape of the region. The contrast between earth and sky and the importance of farming on the Llano Estacado has inspired the creation of Harvest Flower. 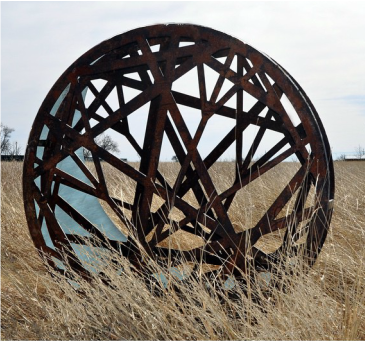 The sculpture is reminiscent of windmills that drew precious water to the surface which gave life to valuable cotton fields that shaped the landscape of the High Plains. It tells a story of how agriculture has evolved and fields also consist of other crops such as sunflowers. No matter the crop harvest will always represent sustenance and celebration on the Llano Estacado. Harvest Flower is Available for Purchase after August 2017. Size: 56" x 48" x 18"
Prairie Moon Is an exploration of the bold impact the moon and its silhouette can have on the landscape and how the landscape imprints on that silhouette.